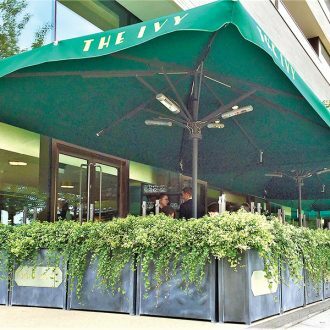 Our planters can now be seen outside many new Ivy Brasseries springing up around the country, just like these at Tower Bridge in London. When we were asked to design and make the first batch of café planters for Tower Bridge last year, we were delighted that The Ivy chain chose our solid steel planters in the Aged zinc galvanized finish above all other companies currently making or supplying planters. Obviously timber would rot and need constant maintenance, terracotta would crack, lead is too heavy and expensive (and would get stolen?) and soft aluminium can’t take the knocks in a public place. Our solid steel planters are the perfect long-lasting solution for any exterior environment, be it a commercial restaurant or a cosy terrace behind a thatched cottage. Yes we can make to measure as well as add traditional or contemporary trellis panels for screening or clear panels to act as windbreaks (as well as castors of course!). Painted finishes? Not a problem. Round ones? Triangular ones? How many? We’re very excited about our new ranges being launched later this Spring. Get in touch for more information.